I had the fortune to be browsing a couple of books that time and ability prevent me yet from restoring, including a completely battered and ruined copy of The Book of South Wales, a tourist guide printed in the 1840s, and, if its condition is anything to go by, a companion on a vast sum of Welsh holidays. It was on one of my own holidays in that perfect country that I came across the book, tucked behind a number of others in a shop crammed to the rafters with old volumes. Missing the entire binding, pages grubby, with some missing and others detached, even the few pounds I paid for it may have been more than it was worth – but the content of it is indeed priceless. I thought, kind reader, that I would be merry enough hereabouts to share a wonderful passage, which just happens to describe one of my favourites of those famous Welsh fortresses. Now to the Castle! The person to whom the key is entrusted lived out of the town, and although sent for, did not make his appearance. It was the grey of the evening. As we walked below the walls, and lamented the injuries sustained by the great gateway – now blocked up – Dr Johnson’s observation to Boswell came into our mind, that “one of the Castles in Wales would contain all that he had seen in Scotland.” The situation of the fortress was admirably chosen, the Gwendraeth forming a sort of natural moat round two sides. We gazed upwards to the graceful ruin of the Early English Chapel, which breaks the line of defence to the east; we admired the union of elegance with massiveness – walls which seem to bid defiance to time, pierced with light trefoil-headed windows. Then, the towers. There are four round towers, each the size of a donjon, besides the enormous towers which flank the chief entrance. A half moon cast an exquisite light over the stately ruin, as we stood at the northern end, where a modern gate, 25 feet high, has been placed to shut out intrud-ers. This obstacle excited our ar-dour. We scaled it, and entered the court yard, the extent of which was not visible through the gloom. Bats whizzed about, and two white owls, disturbed by our presence, flapped across us, sailing up and down in the moonshine over the ramparts, and whooping mournfully. We went stealthily onward through this court into another, from which it is divided by a tower and walls of great strength. The hour – the death-like stillness – the solitude – the darksomeness and depth – the fear of falling into some yawning dungeon (we narrowly escaped one) were indescribably thrilling. We started. Two large white objects moved from us, in the dim and spectral light… bah! They are only horses. What a moment for a superstitious man! Another court; divided, too, by towers and walls more ponderous than those we had left behind. So the garrison had three strings to their bow – a succession of defences of immense strength. And, now regardless of danger, as if under the impulse of a spell, we found our way up broken staircases and winding passages – explored the interior of the great gateway towers, lighted with loop-holes, through which the moon cast rays that far surpassed the best effects of Cattermole. As hour passed we knew not how. The increased elevation of the moon gave distinctness to the outlines, which looked under that light gigantic beyond anything we had ever recollected in military architecture. – We once more scaled the gates, sauntered long on the pleasaunce on the northern side – once the resort of courtly dames and highborn cavaliers – and departed with the conviction that justice has not yet been done by pen or pencil to Kidwelly. I’m in the middle of putting together a little post on a funny stick found on Danbury Hill about 250 years ago. Until then, permit me to present these honest lines upon this concourse of internet, one hundred years after Verdun. To lands of man and beast. And each one true and brave. In lands of earth and bone. Who for our freedom died. Most weekends I go out for a good long walk around the woods, especially during the winter when they’re quiet and the atmosphere is crisp and dramatic. 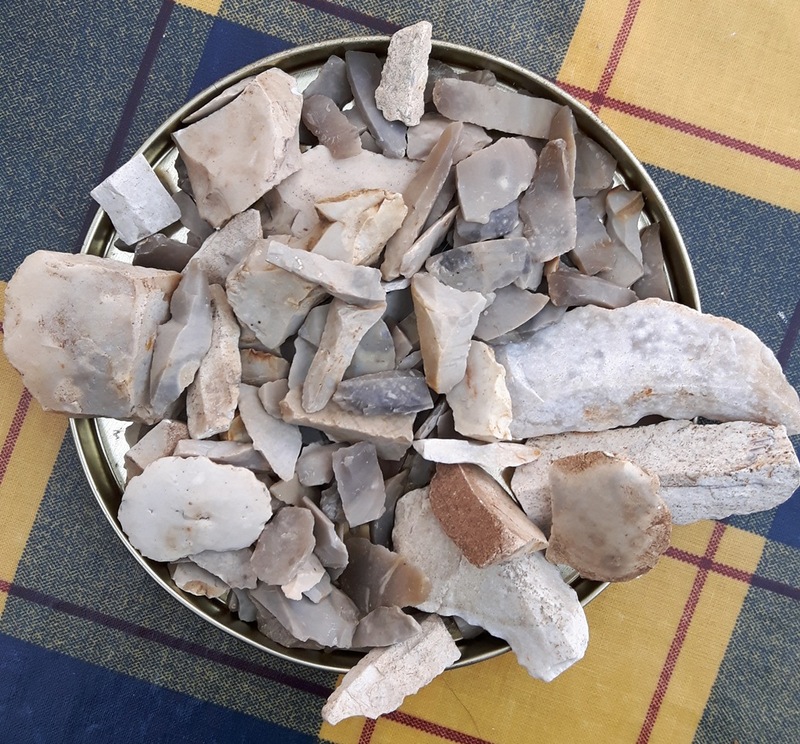 Living on top of an ironage hill fort, with bronze age and earlier earthworks in the woods around it, I often find myself picking up worked flints – blades, scrapers, and arrowheads. I would even kindly admit, with complete acceptance of my failure at understanding fashion for some years now, that for a brief while when I was in Aberystwyth I had a Mesolithic arrowhead hung on a leather necklace round my neck, which I’d put together after finding the arrowhead on a Welsh hill. I’d always thought that our modern affection for these beautiful flint tools was a product of our advancing understanding of history and science over the last two hundred years, which had proved these were not chance broken stones, but in fact the work of people who had lived thousands and thousands of years ago. How wrong I was. In fact, people have been finding worked flints on the ground for as long as history can remember, and for centuries there were far more fantastic legends surrounding them than just a tale of some five-thousand year old hunting party. In pagan Scandinavia over a thousand years ago they were referred to as Thunderstones, and supposedly were the remains of thunderbolts fallen to earth. There they were worshipped as family Gods, and well after the Christian conversion of that country they were still seen as a protector against thunder storms. The church quickly caught onto this worryingly pagan practice, and at least by the 11th century were spreading their own story that these worked flints were the left over weapons of angels that had fallen to earth when they drove the Devil out of heaven. Elsewhere in Europe and even beyond they are believed to have healing or protective properties, seen tokens of luck, and even supposedly to protect the carrier against witchcraft. It is this protection against witchcraft that brings me on to British folklore around these flints, and the tale of Elf Shot. For an unknown reason, even Roman Britons had a fascination with flints, and they occasionally turn up in burial urns. The British legend surrounding these stones, however, dates from a little later – with the excellent people who brought in the birth of our Britain – the Saxons. Earliest written evidence of the story is found in the Wið færstice, a fragmentary Saxon medical text written some hundred years before the Norman conquest, it names the flints as the arrows of Elves, invisible creatures who follow people around and at any moment fire an arrow at them, causing severe pain. This was used to explain the cause of arthritis, aching joints, and other odd pains that people may have felt. To ward off this pain, then, a person would have to go out and find a piece of Elf Shot and wear it – remaining archaeological evidence suggests as a pendant – which would deflect any further elf arrows. The original date of this legend is unclear, but a viking pendant found in the UK is one of the oldest extant examples of a piece of Elf Shot that someone has worn, and likely dates no earlier than the 9th century. It is possible, then, that this practice of wearing elf shot to ward off pain is somehow descended from an earlier Scandinavian tradition brought over by the vikings. Later on in the legend’s history in Britain, wearing Elf Shot was seen as a protection against witchcraft in general, elves traditionally being one of the most mischievous magical creatures around according to British folklore. The practice was still going on in more rural parts of Britain well into the 17th century, and it wasn’t until the mid-18th century when examples of Native American stone weapons were brought back to Europe that a connection began to be made between the stones and possibly an origin in earlier civilizations. With the church strongly against this view, since it would suggest that the world was older than the bible claimed, it did not gain much popular notoriety, and it wasn’t until at last in 1847 that a book was finally published proposing the idea, and, after significant opposition, the myth of thunderstones and Elf Shot finally vanished into the dusts of disproved myth at the end of the 19th century. Have no fear, though, kind reader – for though the legend may have quietly fallen out of our folklore, you can still happily wander the fields and hillsides and pick up the flint tools that have fascinated mankind for well over a thousand years, and will certainly continue to be beautiful objects for millennia to come. *if inaccurate, try checking lost property. I must be more ill than I thought; rather oddly I have no memory of having written this blog post. I just found it open on my laptop when I turned it on. Allow me to present three poems that I am pleased and displeased with, since it is surely important to sometimes share poetry that one believes to be terrible, with the hope that one is wrong. Still wearing his rabbit ears from Halloween. Aunt Mable was crying so she had to leave. Cremated that uncle, and dad’s on the run. On the hill it wakes the leaves. In both Death plays his waiting game. What fortunes rise that outlive death? To fight over, and lose again. Try carrying a thicker umbrella next time. I’d completely forgotten about this grand binding I produced a few months ago – my first ever commission to produce a binding, rather than just dabbling around adding leather to my own books. It followed the style of a paneled binding, with the centre panel decorated geometrically with ‘hidden’ initials. Also, kind reader, I’ve been dabbling again in my rather dull attempts at poetry. So, with my apologies for its quality, I’ll end this post on that. Amber cushions fading from the treetops. All quiet to the whispering hills. For one moment hidden from every eye. And the dull quiet of famous night. Until another welcome day, dearest reader, adieu! Allow these humbly presented lines to be a brief addition to this meddling blog. I have half a dozen finished bindings yet to blog about, and easily another half a dozen projects on the go. Consider this, therefore, honest procrastination. Oak trees held up silver hands. Wove thick around the earth and I. The proof of all the new year rows. Till spring will come and cure it all. Regrettably, kind reader, I must leave off there.